So, Alaina and Trevor are getting married Saturday! I just happened to realize I never shared their engagements on the blog! We took them at the end of December, back last year! Yes, I'm failing on timely blogging but at least I'm making progress! Anyways, they came to my mom's house in Sherman, Texas and we went to Loy Lake park to find a little green and gold in december and then after that we went to a family friends land and put to use the rocking chair and stained glass window and suitcases they thoughtfully brought as props. We found the perfect tree to hang the window up and the setting sunlight glistened through. Alaina also brought their UT and A&M jackets (they attend rival schools!) for a few playful photos. It was a little chilly but lots of fun and at the very end I saw the beautiful sky and we hopped out and grabbed one last silhouette shot! Katie & David were married the day we had a much needed downpour in Wichita Falls. They had their ceremony and reception at Coyote Ranch Resort. I loved all the DIY elements Katie did, like the signs and the programs and she even made the ring bearer's pillow! She had some friends make the Corn Hole game and the Giant Jenga (that she had guests write words of advice on!). The Basketcase did their flowers, so simple and beautiful. A Heavenly Cake made the brides cake, yummo! They had a relative make the grooms cake, love the cake ball pool balls! Even with the rain and delays the ceremony was beautiful and David was grinning ear to ear when Katie walked down the aisle to her groom. Thank you so much for having Seth and I be a part of your day! 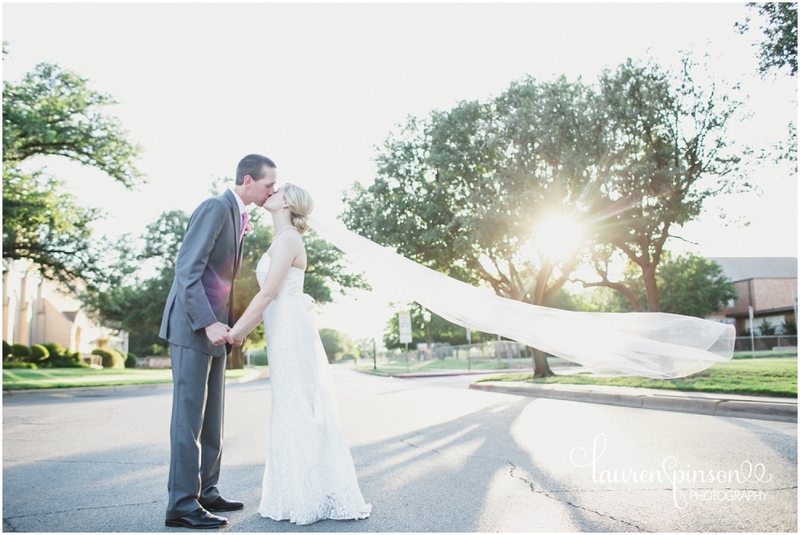 Katie & David's Wichita Falls Wedding from Lauren Pinson Photography on Vimeo. If the video isn't working click here to watch it! It's worth it!